Some people collect garden gnomes; others strap planks to their feet and throw themselves down mountainsides on a surface that provides no friction. I see no appeal in skiing. But the wonderful thing about human beings is that we’re all unique; each of us with strengths and weaknesses, likes and dislikes. Me, I have a darkness in my heart. Somewhere along the line I inherited an anorak that draws me to old railway tunnels. There’s no accounting for it; neither apparently is there a solution to help me free the zip. Tunnels are, by their nature, overlooked. It’s easy to appreciate the grandeur exuded by great station buildings or the landscape-defining viaducts that span our valleys. But tunnels? They’re cold and sinister; wet, filthy, miserable, featureless - not attractive qualities to a society besotted with the quest of transient celebrities to remain forever youthful, even if that involves looking like an alien. Perhaps that’s it: tunnels offer the perfect getaway from all that. No service. Heritage is something we’re increasingly serious about. It’s been a slow-burn but we now understand that once it’s gone, there’s no bringing it back. The railway engineer’s mark should not be indelible but he often touched hillier parts of the country in magnificent ways. That should be appreciated. And yet, since their lines closed, many outstanding structures have been sacrificed at the altar of health and safety or for the development potential of the land they occupied. Workaday infrastructure continues to be opportunistically demolished where it realistically has nothing to offer. But can you imagine the outcry if developers tried to bulldoze the ruined foundations of an abbey or perhaps some castle earthworks? 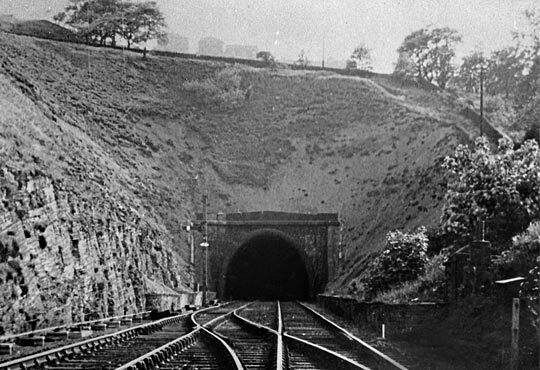 Queensbury Tunnel's north portal before the effects of closure took hold. Listing can be used to establish (though not permanently) a protective ring-fence around significant railway assets and many hundreds are now safeguarded in this way. The Railway Heritage Trust has, since the mid-Eighties, assisted with the conservation and upkeep of notable buildings and structures - both operational and disused - whilst other parties work to raise their profile by researching, recording and celebrating. You’d struggle to find a listed tunnel though. How do you get folk to take notice of something that offers very little in three dimensions? Indeed, so risk averse have we become that many agencies are probably keen that we don’t try at all. But we should. If you look beyond aesthetics and apply more substantive criteria - magnitude, impact, ingenuity, adversity - tunnels compare favourably with the greatest. The one under the Severn took five years longer to build than the Forth Bridge did and is getting on for three times its length, but it rarely troubles our consciousness. Does that really matter? Perhaps to Peter Harris, Tunnels Convenor on the Panel for Historical Engineering Works (PHEW), the most authoritative body of expertise on civil engineering heritage and established to promote a broader awareness of it by the Institution of Civil Engineers in 1968. But Peter’s role is not an easy one. 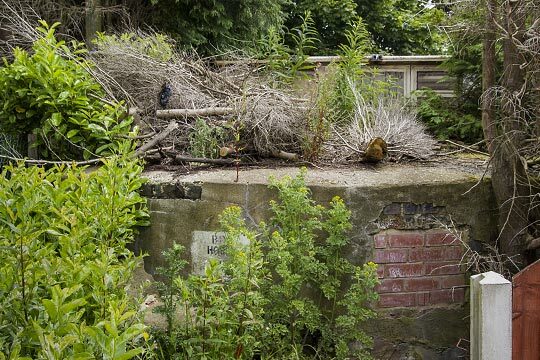 The PHEW database of more than 3,000 historical structures includes just 135 tunnels, despite Britain’s railway companies building more than 1,200 of them in 200 years. Preserving a disused tunnel for the next generation to take for granted relies on promoting a practical use for it. Some options can be ruled out immediately if you’re seeking legitimate sources of funding (trying Googling “disused Faenol tunnels”) which tends to leave just two: tourist attraction or cycle path, with the latter often becoming the former as the mile-long Combe Down Tunnel in Bath has. Keen to follow in that city’s tracks - and push the envelope in terms of length - is a village perched on a hill to the west of Bradford. However securing a future for its tunnel will, as a first step, require Ministerial intervention. Queensbury is dominated by Black Dyke Mills (yes, of brass band fame), a vast monument to the textile industry around which the community was built. The mills’ owner, John Foster, played a leading role in promoting the Great Northern’s Halifax, Thornton & Keighley Railway as part of a strategically useful north-south route. Ironically, the line didn’t serve the village well as it passed 400 feet beneath it in a 2,501-yard tunnel, but the adjacent station - where a connection to Bradford diverged - was rare in having inner and outer platforms on all three sides of a triangular layout. A combination of water ingress, gradient and backfill has condemned the south portal to a decade drowning in a lagoon. Blessed with a micro-climate that’s perfect for ducks, Queensbury has not been kind to its tunnel. Water is a theme that runs through its story, defeating the pumps at two of its seven construction shafts, forcing their abandonment. One was leased by the mill and its contents piped to a reservoir there. Expected to take two years, 600 navvies made a living here for more than four, and it would have been longer had Major Beaumont of the Royal Engineers not arrived with a gang of Welsh miners and his new-fangled rock drilling machine. Still wet in its redundancy, a combination of gradient and backfilled approach cutting mean that the south portal has spent much of the past ten years in a 30 feet deep lagoon, extending 1,000 yards into the tunnel. Scour from the penetrating water and the effects of freeze-thaw have brought an inevitable deterioration of the brickwork; ground movement - possibly a function of nearby mine workings - has caused the arch to bulge and crack in places. But that’s what you get when a structure goes without serious maintenance for 50 years. At least it’s not home to anyone…except during the Seventies when scientists slept in a hut close to No.3 shaft during experiments to determine the effect of elastic inhomogeneities on surface waves from earthquakes and tidal strains. As you do. Those defects are small beer in liability terms, the tunnel being so far below the surface and pushed through self-supporting rock. Presenting the greatest issue for its owner, the Highways Agency (HA), are those seven shafts. No.4 shaft is, for example, 12 feet in diameter and 379 feet deep. Carrying the column of brickwork that forms its lining - weighing upwards of 560 tons - is a curb of large masonry blocks which transfer the load into the arch of the tunnel lining. Water ingress has an ongoing impact on its ability to withstand that load. 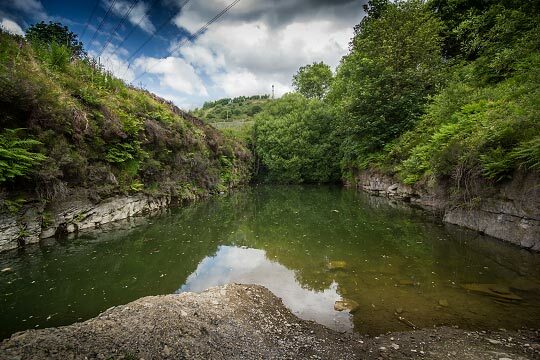 Whilst inspection reports characterise current structural conditions as fair, focussing the Highways Agency’s mind on the long term is the presence of two properties within 20 feet of the shaft cap. And a similar story can be told at other shafts. No.4 shaft's cap is located between two properties, creating a significant liability for the tunnel's owner. Back in 2009, British Railways Board (Residuary) - the tunnel’s then-custodian - commissioned a feasibility study from Jacobs on future asset management options. Its preferred approach was to carry out infilling works to the critical elements, notably the shafts and sections of tunnel beneath them. This came with a £5.1 million price tag but the residual risk level was very low, paving the way for the structure’s abandonment. Under the Highways Agency, the project’s reset button has effectively been pressed but HA does concede that “we have been making plans to carry out necessary maintenance work to the tunnel over the next five years, but this work is subject to funding and the ongoing prioritisation of all of our work.” Unless the tunnel’s condition has miraculously improved in the past five years, it’s fair to presume that the funding will have to be found at some point. Muddying the waters for the Highways Agency is the sudden awakening of interest in the tunnel, prompted by the prospect of losing it to mass concrete plugs or similar. HA’s remit allows it only to manage the liability but an increasingly vocal body of opinion believes that if a chunky sum of public money is going to be invested in this black hole, the remedial works ought to be engineered such that taxpayers get some return. That means maintaining a through route so the tunnel can be brought back into use as host to a cycle path. Beyond the obvious benefits - commuting, leisure, tourism, health - campaigners see this as a vehicle to re-energise Queensbury, its needs being generally overshadowed by the social issues in urban Bradford, three miles down the road. 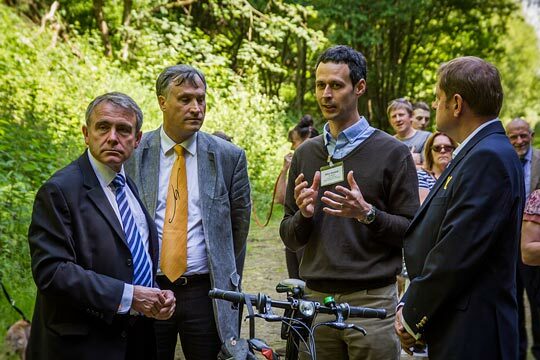 Transport Minister Robert Goodwill (left) is briefed on the cycle path opportunities by Sustrans' Mike Babbitt (second from right). “Once-only” because the Highways Agency is likely to finalise the design for its works in the autumn after the water has been pumped out and a condition survey undertaken. If the concrete is poured as plugs rather than supporting arches, the fight will be lost along with the tunnel. So Norah secured a fact-finding visit from a man with influence - Under Secretary of State for Transport Robert Goodwill whose portfolio encompasses cycling. If his Department instructs HA to preserve a passageway through the tunnel, that’s what will happen. 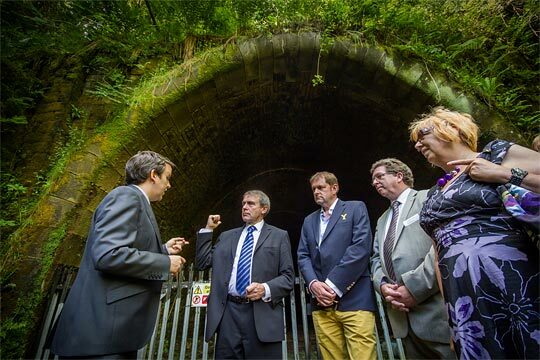 An unlikely gathering at Queensbury Tunnel's north portal: Tom Jones from Bradford Council, Robert Goodwill MP, Gary Verity of Welcome to Yorkshire, Gerry Sutcliffe MP and Councillor Val Slater from Bradford Council. So it is possible to open eyes to a tunnel’s potential even if we are mostly oblivious to them. Should they be preserved for the sake of it when the railway has done with them? Not when there are schools and hospitals to invest in. But neither should they all be written off as burdensome - they only are from one viewpoint. If you take another look without the tunnel vision…apologies…lazy cliché there, they can fulfil valuable roles which bring preservation by default. Several dozen are already doing so. We’ll know within months whether Queensbury is to join them. The Highways Agency has agreed to share the findings of its investigations with stakeholders and its Historical Railways Estate team is committed to actively maintaining a positive relationship with Sustrans which - like the Great Northern Railway before it - sees the tunnel as critical to a north-south link in its expanding cycle network. Over to you Mr Goodwill.